Chillout Productions has announced their final line up of all artists showcasing at the 16th edition of the Emirates Airline Dubai Jazz Festival 2018. 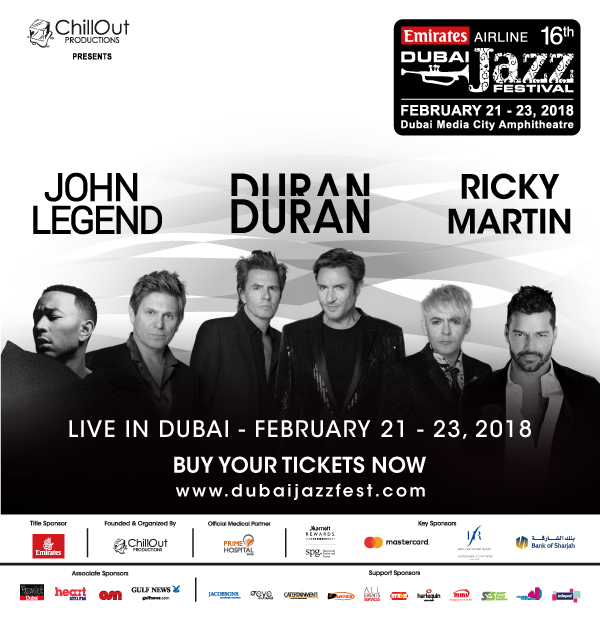 Previously, the organizers had confirmed that Grammy award winning Duran Duran, John Legend, and the evergreen Ricky Martin would be setting the stage ablaze with their performances at the festival, taking place at the Dubai Media City Amphitheatre between the 21st and 23rd of February. Duran Duran will perform both fan favorites and monster-hit singles from throughout their career alongside songs from their most recent, Top 10 charting record, Paper Gods. Much of the band’s sound and style has inspired and been adopted by many of today’s top pop, indie and electro-rock outfits, yet decades into their career, Duran Duran are still going strong and show no signs of slowing down. Renegade Brass Band have already established a big live reputation as a headline act, and have played packed-out shows at venues around the UK and Europe, and in the last year, they have supported acts including De La Soul, Busta Rhymes, Grandmaster Flash, Public Enemy, The Cat Empire, Jamie Cullum, Quantic, Craig Charles and many more. A hit with festival crowds across Europe, the band have played at UK festivals including Glastonbury, Java Jazz Festival Jakarta, Sea Sessions Ireland, Black Sea Jazz Festival, Stuttgart Jazz Festival and Soundwave Croatia. John Legend will bring smooth soul and sultry R&B to the stage, fans can expect to hear his new singles as well as his greatest hit All of Me from his fourth studio album ‘Love in the Future’ which claimed the #1 spot on Billboard’s Hot 100 Singles Chart and reached #1 on both Mainstream Top 40 and Rhythmic Charts. All of Me marked Legend’s highest selling and charting single to date, with sales over 5.5 million worldwide. Ricky Martin is responsible for bringing Latin music to the forefront of mainstream pop with hits like “Living La Vida Loca”, “The Cup of Life” and “She Bangs”. He has sold over 70 million albums worldwide with a track record including 95 platinum records and continues to perform to sold-out stadium and arena audiences throughout the world. His recent single “Vente Pa’ Ca” became one of the biggest hits of 2016, topping the charts worldwide. Martin’s tenth studio album, A Quien Quiera Escuchar, debuted at No. 1. The album won “Best Latin Pop Album” at the 2016 Grammy Awards.